Whether it is an apple for the teacher, the Big Apple or a first bite of the apple, this shape has special meaning. Apple recognition awards show respect and acknowledgement with a wry but definite respect for the recipient. They are especially significant for educators, for people who are associated in some way with New York City, or those in the health field. These apple recognition awards come in many sizes and designs and in a range of materials. Consider getting a crystal apple award for a retiring teacher. 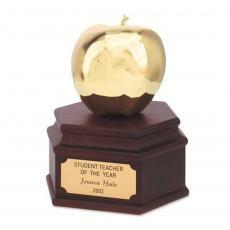 Or a golden colored paperweight in the shape of an apple for a nutritionist. Choose a red-tinted apple in crystal or acrylic for a salesperson who has exceeded his quota. These apple awards can be set on a metal or wood based. Engraved apple awards have personal meaning for the recipient. A teacher can keep it on her desk or in a display case, proof that her students and fellow educators respected her long years in the classroom. $115 - $130| Sizes: 3.5"x5.5"
$125 - $135| Sizes: 4.5"x8" & 4.75"x6.5"
$90 - $106| Sizes: 5.5"
$88 - $102| Sizes: 4.5"